FunTAZMoney/FunTAZ®Money is a promotion sponsored by FunTAZM Entertainment. The bills are available in 5 and 20 dollar denominations and feature various services and products available at FunTAZM. FunTAZ®Money will be available through website promotions, at some live events, and to past clients in thanks for their business. 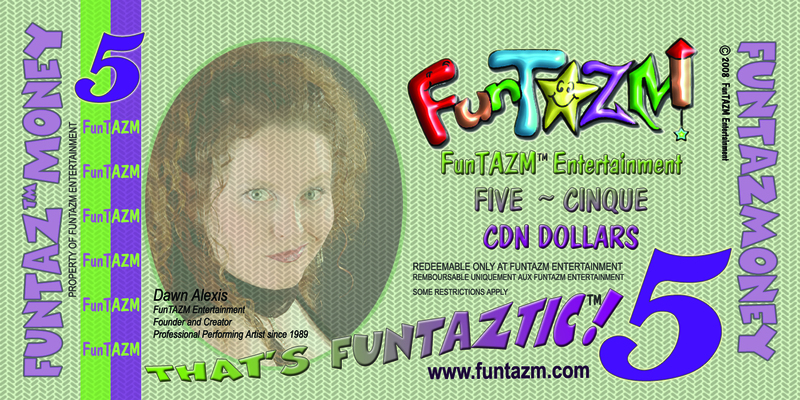 FunTAZ®Money is only valid at FunTAZM Entertainment on Live Entertainment, Corporate Training, Motivational Speaker, Writing, Graphic Design, Singing Telegrams, Improv, Theatre, Clowning, Children's Birthday Parties, Silly Science, Face Painting, Balloon Animals, and more. Please read the rules below for more information. FunTAZMoney/FunTAZ®money is redeemable only at FunTAZM Entertainment on certain services and products. More than one bill of FunTAZMoney/FunTAZ®money may be applied to select services and products but may never exceed the maximum allowable on that good or service. FunTAZMoney/FunTAZ®money may not be used on bookings that take place on or between the dates of November 25th through to January 2nd, or on any statutory holiday. Singing Telegrams: Up to 25% of your total before GST. Event M.C. : Up to 20% of your total before GST. Wedding Music: Up to 10% of your total before GST. Other Wedding Entertainment: according to that form of entertainment as listed here (ie. Giggles the Clown, Singing Telegrams, etc.). FunTAZ®mprov Games- 45 minute show: Limit of $50.00 per booking. Schtick It To Ya'! Sketch Comedy - 45 minute show: Limit of $50.00 per booking. FunTAZMingling/FunTAZ®Mingling - 45 to 90 minutes: Limit of $35.00 per booking. FunTAZ®cience/Silly Science Stage Shows: Up to 25% of your total before GST. FunTAZ®cience/Silly Science Birthday Parties: Up to 20% of your total before GST. FunTAZ®cience/Silly Science Workshops: Up to 15% of your total before GST. Giggles the Clown Mingling: Up to 10% of your total before GST. Giggles the Clown Stage Show: Limit of $40.00 per booking. Giggles the Clown Birthday Parties: Up to 10% of your total before GST. FunTAZMic Faze Painting: Up to 10% of your total before GST. Balloon Twisting: Up to 10% of your total before GST. Daisy the Dinosaur Hunter Stage Show: Limit of $40.00 per booking. FunTAZMmmm Show on Nutrition and Health: Limit of $40.00 per booking. FunTAZ®mprov Workshops: Up to 25% of your total excluding purchases and before GST. FunTAZMediation Services: Up to 20% of your total before GST. FunTAZMotivational Speaker: Up to 20% of your total before GST. Private Lessons: Limit of $15.00 every 8 lessons and redeemable only upon completion of the 8 lessons. Performing Arts Workshops (minimum 8 participants): Up to 20% of your total before GST. Writing Services: Up to 5% of your total before GST. Graphic Design: Up to 5% of your total before GST. Limit of $5.00 in FunTAZMoney on your first $50.00 purchase before taxes, with the exception of items priced at $15.00 or less. 10% of your purchase price before taxes on purchases that are $50.00 and more. Valid on items advertising on the www.funtazm.com website under "FunTAZMarket". FunTAZMarket Item purchases that are $15.00 or less. FunTAZMoney is the property of FunTAZM Entertainment. FunTAZM reserves the right to refuse redemption of FunTAZMoney on any goods or services if contract and/or rider obligations are not fully satisfied. FunTAZMoney individual bills do not have an expiration date, but the FunTAZMoney Promotion may end at any time. Valid for goods and services booked out of the Regina, Saskatchewan, Canada location and delivered anywhere in Canada. A fun way to appreciate our clients with a rewards and discount program while raising awareness about the goods and services that we offer. © FunTAZM Entertainment. All rights reserved. Design by NodeThirtyThree and Free CSS Templates.